Is A Big Mac With Bacon Still A Big Mac™? MCDONALD’S BRINGS BIG MAC BACON TO THE UK FOR THE FIRST TIME BUT THE QUESTION IS; IS A BIG MAC WITH BACON STILL A BIG MAC™? This is the first time the iconic Big Mac® has been changed in the UK since the burger’s creation in 1968 and opinion is divided on the addition. Big Mac® purists are questioning if the burger should even be classed as a Big Mac® at all, whilst others are welcoming the new addition in to the Big Mac® family with open arms. Join the debate and have your say: #NotABigMac or #StillABigMac. 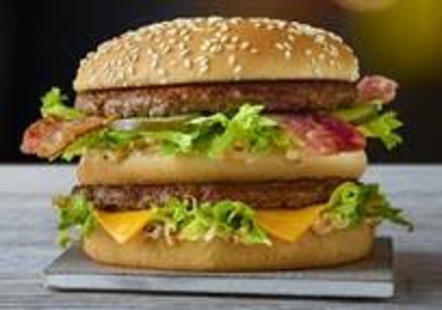 Big Mac Bacon™: The iconic burger, made from TWO all-beef patties, special sauce, lettuce, cheese, pickles, onions, sandwiched between a three-piece sesame seed bun and NOW bacon. As if that wasn’t big enough news, the Grand Big Mac™ and Mac Jr.™ are back by popular demand, and it’s the first time the burgers have returned following their initial sell-out launch in January 2018. And yes bacon fans, you can get the variants with bacon too. The Big Mac Bacon™, Grand Big Mac Bacon™ and Mac Jr. Bacon™ are available in restaurants nationwide for a limited time only until the 19th of March. And if bacon doesn’t tickle your fancy, all three burgers will also be available in their classic style during this time.